Once a baby is about to come, everyone in the home is very excited. The parents would be buying some baby stuff in advance and would also prepare the nursery room. Decorating a nursery room is very much exciting and enjoyable for the parent-to-be. It is a manner of showing how eager they are to see their little baby and how much they love him or her that even before the baby came, everything is already prepared. It even becomes more exciting when the parents get to know if their baby is a male or female which is an important consideration when purchasing baby items and when desiging a nursery. If the baby is female, a pink nursery would immediately come to mind. The color pink is usually associated to cute lovely baby girls and are most commonly used in baby girl items. So, if you are expecting a baby girl, this collection will surely please you. Today, we will showcase 15 pink nursery room design ideas for baby girls. Scroll down and take a look at the beautiful designs we have collected. Lovely pink butterflies fill in this nursery room even on its carpet making your child’s stay in the room cozy. With damask prints of black combined with pink color, this room surely looks sophisticated. Give your baby’s room a feeling of being with the lovely creatures from the garden. Liven up your baby’s nursey with this simple crib with pink floral beddings. It is made even lovelier with framed images on a pink wall. A combination of pink and brown in this cupcake themed nursery. A very cute room with beddings of tiny floral prints and pink paper lanterns on the ceiling. Pink paisleys are seen in the fabrics of this pink room with green and white touches. If you love butterflies, then you will surely like this room for your little baby girl. Look how lovely this pink room is with pink elephant borders on the wall and pink fabrics of stripes and polkadots. So beautiful with its ballet printed fabrics and soft flower accents of pink. It is even made prettier with the toule fabrics. Even dragon flies look lovely especially when they are in pink like the ones you see in this room. 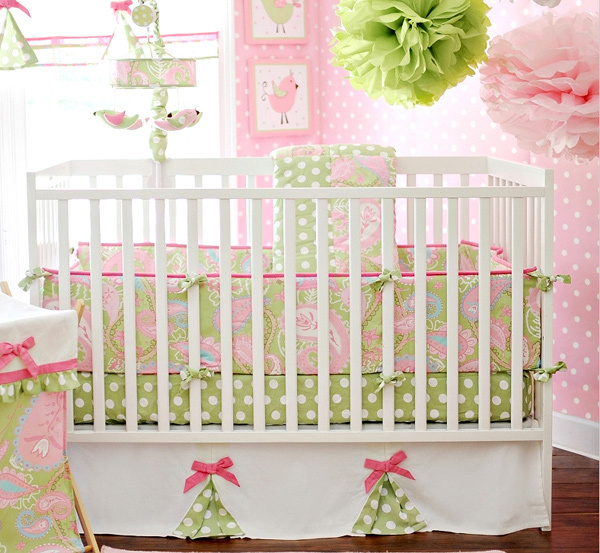 Polka dots look lovely in this pink and green nursery with bird accents. With a victorian touch and the use of lots of fabric, this pink nursery could be a good design to welcome your little princess. Damask patterns are used in this pink room combined with pink stripes. Another room that make use of damask prints but this time it comes in white and pink combinations making it look lovelier. Now that you have feasted your eyes on these lovely pink nurseries, you will surely be moved to design your baby’s bedroom using the above designs as inspiration. Nothing would be more fulfilling than exerting effort in creating stuff for your little ones. You will enjoy decorating and you will even be happier once you see your little princess in the room you have designed in all smiles. You can also try to look into our tips in designing a bedroom which can be of help in your work. We hope that the design inspirations we have above could help you a lot in decorating your baby girl’s nursery.